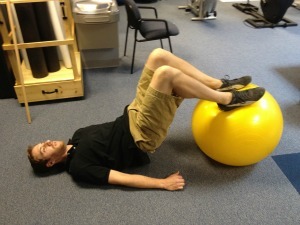 Adding an exercise ball to your leg strengthening routine is another great way to mix things up by slightly altering some familiar exercises. 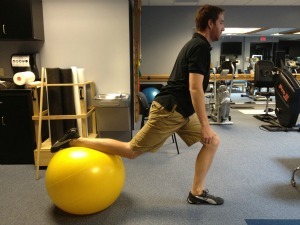 When examining the proper golf swing, a strong lower body is crucial to maintaining stability and balance. 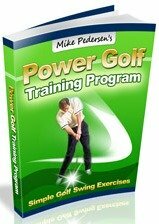 A ball is fantastic for increasing the difficulty of your golf strength training program because it forces your to use muscles other than the primary mover to help stabilize. When focusing on leg strengthening, it is important to target some main muscle groups. These muscles are the quadriceps, hamstrings, glutes, and calves. You can work all of these muscles using an exercise ball! -Stand facing away from a wall with the ball between your low back and the wall. Perform a squat by bending your knees and lowering until your knees are close to a 90 degree angle (you may need to move your feet a few inches in front of you prior to beginning the squat to accomplish this). -Return to starting position. If you want to add a quick calf workout, each time that you return to the starting position stand on your toes briefly before performing the next squat. -Lie on your back with the ball at your feet. Bend your knees and place your feet on top of the ball. Elevate your buttocks and hold. Return to starting position. -Lie on your back with knees straight and heels resting on the ball. Elevate your buttocks and hold. Return to starting position. -Same as straight leg bridge but once rear end is elevated, slowly lift your right leg off of the ball, balancing with the left. 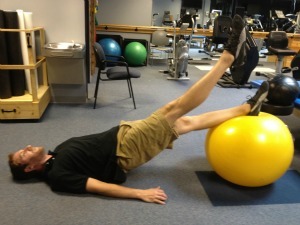 -Return your right leg to the ball and then lift your left. 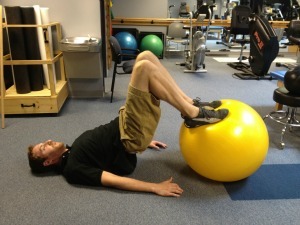 -Once both legs are back on the ball, you can either continue to alternate leg lifts, or you can lower your rear end and repeat the process again from the beginning. 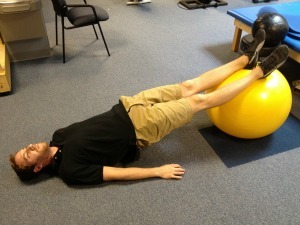 -Lie on your back with legs straight and resting on the ball. Elevate your rear end and roll the ball towards you by bending your knees. Straighten legs and then repeat. 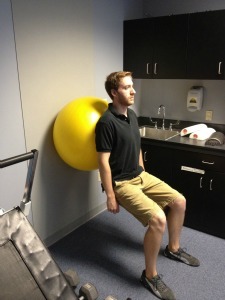 -Stand on one leg in front of the stability ball, with the shin and front of the other foot resting on top of the ball. -Perform a single leg squat by lowering your body with the stance leg. -Be sure to make sure that the knee on your stance leg does not travel too far over top of your foot. If that happens, it will place too much stress through your knee.